William Joseph Dunlop, or Joey Dunlop as he was popularly known, was without doubt one of the greatest motorbike riders to ever grace the track. He is a former multiple World Champion motorcyclist. Dunlop was born in February 1952 at Ballymoney in Northern Ireland. He started competitive motorbike racing in 1969 but made his debut at the Isle of Man Tourist Trophy in 1976, where he became the most successful, winning a total of 26 races. On his way to the Isle in 1985, Dunlop escaped death by a whisker. The vessel he was travelling in together with other riders hit a rock in the sea and sank. All the riders were however rescued and their bikes recovered. 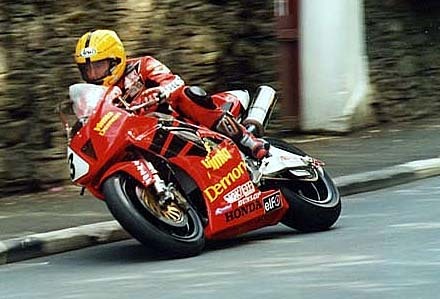 Dunlop went ahead to win three hat-tricks at the Isle of Man TT that year and also in 1988 and 2000. The rider, who always wore a red t-shirt and a yellow crash helmet, won the Ulster Grand Prix 24 times and the Formula One World title five times among other achievements. In 1996, Joey was awarded the Order of the British Empire (OBE) for his charity work. He always found time before racing seasons to take food and clothes to orphans in Romania, Bosnia and Albania. It is on the road where he found fame and fortune that Dunlop met his death in July 2000. While riding on his Honda in a 250cc race in Tallin, Estonia, Dunlop lost control and crashed on a tree dying on the spot. In 2005, five years after his death, Motorcycles News voted him the 5th Greatest Motorcyclist Ever. Besides his erected statues, the most successful rider in the annual TT series is awarded the ‘Joey Dunlop Cup’ in honour of the racing legend.